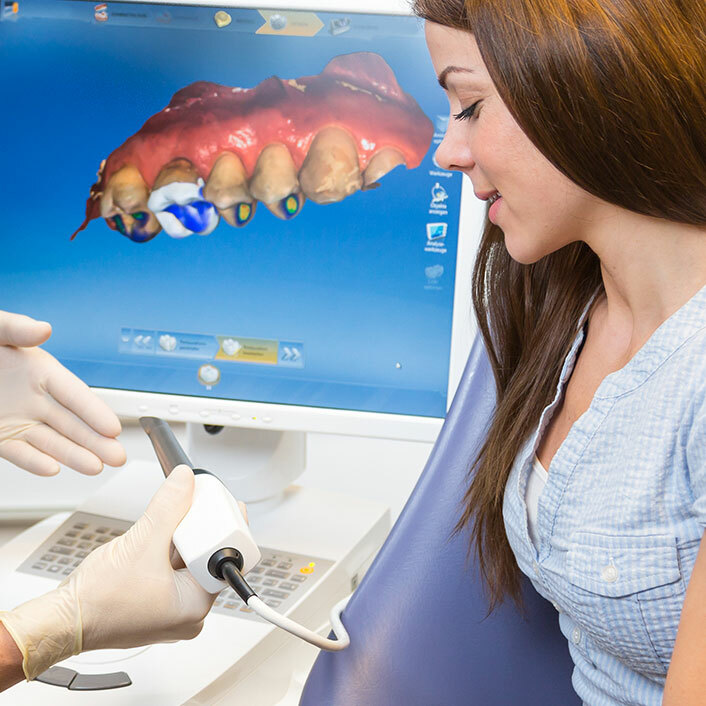 CEREC is an acronym for CEramic REConstruction, using CAD/CAM technology. Did you know that in the United States, one person dies every hour from oral cancer? Laser dentistry is a great advancement in dental technology, treating a wide range of dental and cosmetic problems from cavities to gum disease to teeth whitening. The lasers we use at our practice are an alternative to the common hand-held scalpel, drills, or other tools. These lasers direct an invisible energy beam onto problem areas and allow us to efficiently treat decayed teeth, enamel, and gums. Soft tissue lasers are used to safely remove soft tissue, such as excess gum tissue. The soft tissue laser can also be employed to destroy bacteria in gum pockets, decreasing infection and allowing the tissue to return to a healthy state. The soft tissue laser is used most often by our laser certified hygienists to help them treat periodontal disease. 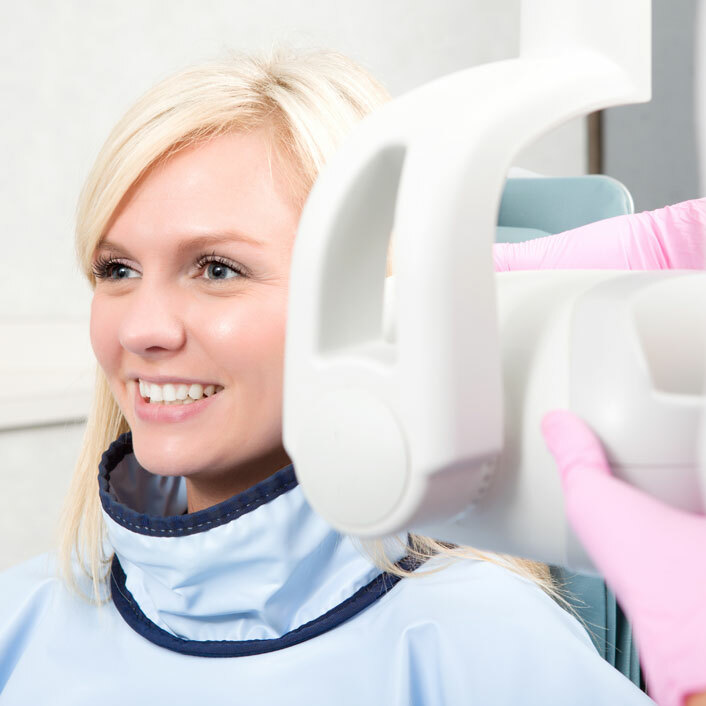 Hard tissue lasers are used to remove old fillings, repair cavities, and prepare teeth for fillings and bonding. I also use this laser on soft tissue to contour gums for better esthetics, as well as treat gum disease, decrease mouth sore pain and remove lesions. This is one of my favorite ways to improve your dental health. 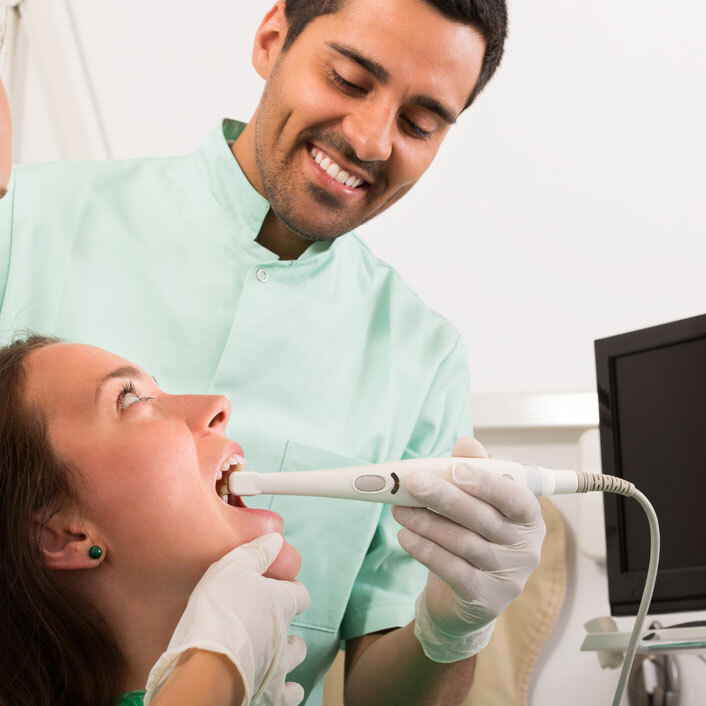 Diagnosing cavities in the back of the mouth using traditional methods is difficult; studies even show that 50% of cavities are left undetected in these areas. However, the new DIAGNOdent enables us to locate and treat these cavities, putting a stop to further decay. The laser is easy to use, harmless, and will alert us with an audible signal if it detects a cavity. It will even calculate the approximate size of the cavity so we can better plan treatment. By using this device, you can rest assured that cavities will be accurately detected and treated in their infancy. We offer laser whitening for those of you who want faster results and prefer to not whiten at home. A gel applied to the teeth is activated by our Biolase EZlase wand to whiten your teeth in under an hour. The most important factor in maintaining dental health is stable healthy gums and the bone around the tooth. 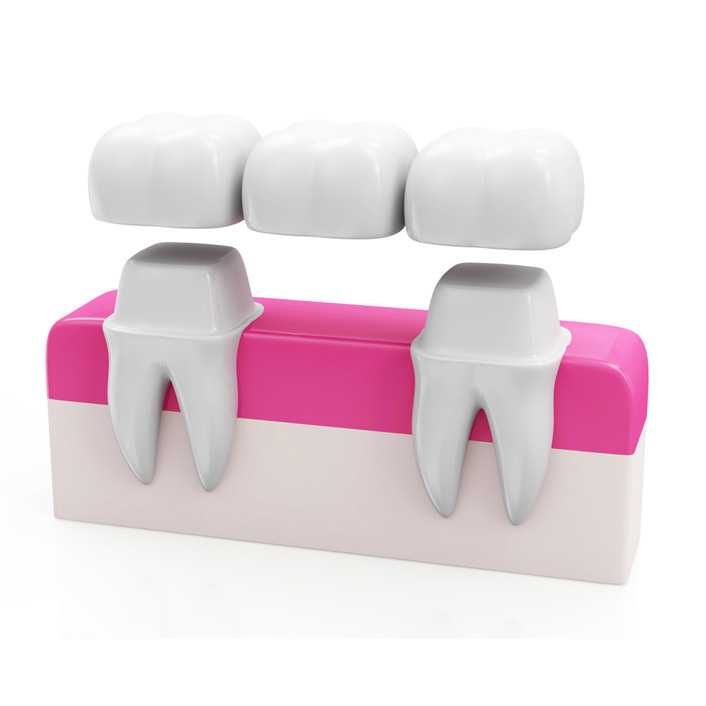 Just like the foundation of a home is key to its longevity so the gums are to support of the teeth. Gum disease is the leading cause of tooth loss. On your first visit we probe the gums, look at tissue health and tooth stability. A healthy probing depth is 1-3 millimeters. If your gums are healthy a normal recare visit to clean by scaling calculus (tarter) from the teeth and polishing stains will be done, usually in a one hour appointment. A recare return visit usually in 6 months will be agreed on. Athletic mouthguards, made of flexible molded plastics are recommended to protect the jaw and teeth during physical activity and sports such as boxing, football, basketball, or other activities where your mouth may get hit. There are two types; custom made in our office or store bought like “Shock Doctor”. In addition, these guards protect the soft tissues of your tongue, lips and cheek lining. Nightguards are recommended for patients who clench or grind their teeth at night as a way to protect their teeth and bite. Made of a hard outer plastic layer and an inner soft layer they also reduce clenching by concentrating bite forces to the front teeth. 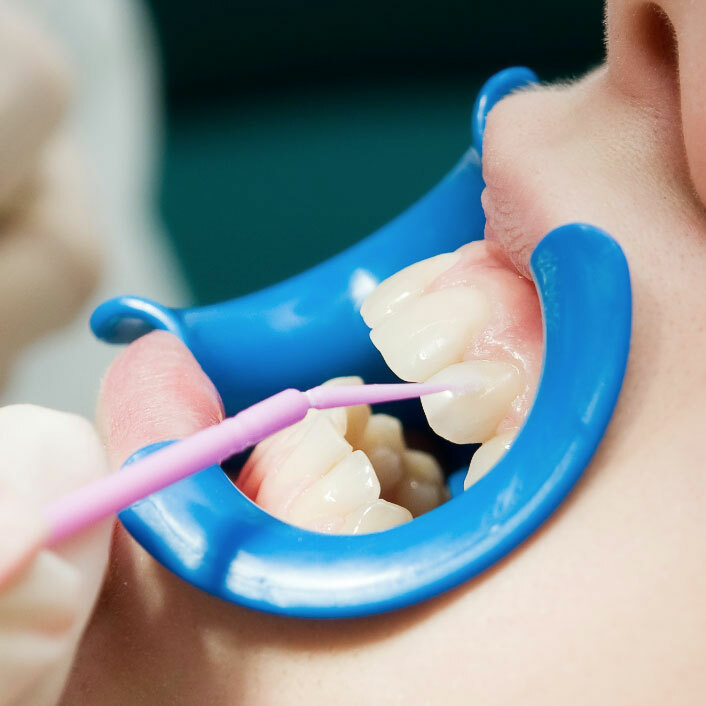 If you have decided a guard is right for you, we will take an impression of your teeth which will then be sent to a lab to make a custom fit guard for you. In most cases you can choose from a variety of colors and styles for your guard. On average, guards last between 3 and 10 years. Let our skilled team help you determine if a guard is right for you! A denture is a removable replacement for missing teeth and surrounding tissues. 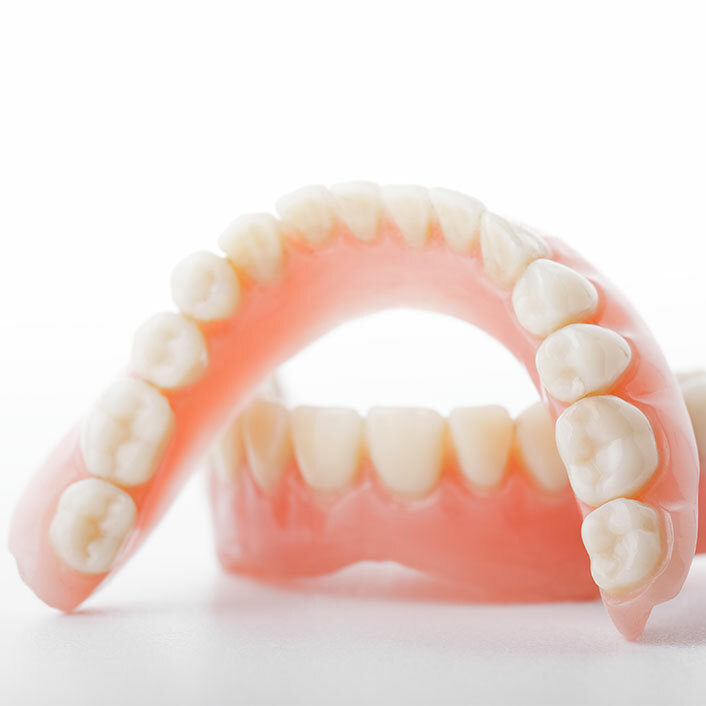 There are two types of dentures available—partial and complete dentures. Partial dentures are used when some natural teeth remain, while complete dentures are used to completely replace all teeth. Dentures are made to resemble your natural teeth so there should be no noticeable change to your appearance. In fact, dentures may even improve your smile. This restoration method is used to restore your smile and mouth function if all your teeth have been lost. The dentures are custom created to resemble natural teeth and are positioned into a patients mouth to take the place of where the natural teeth used to be. 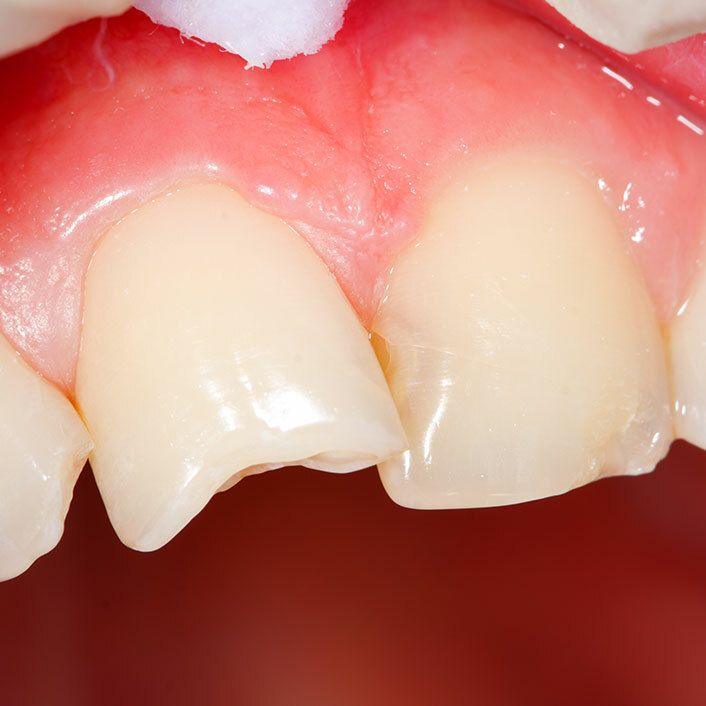 Complete dentures are removable and may require adjustments in order to create a proper fit with the gums and mouth. 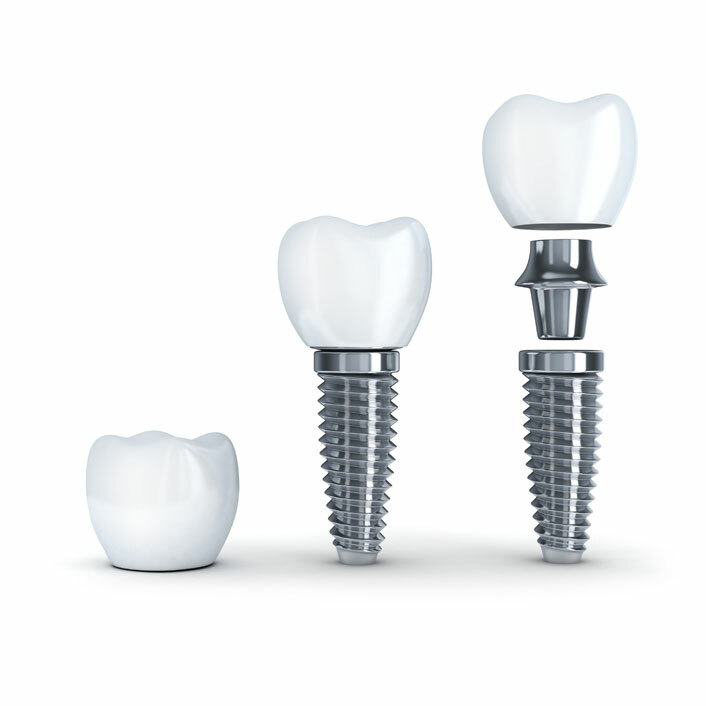 Lower dentures have little “suction” so a mini implant supported lower is now the standard of care. 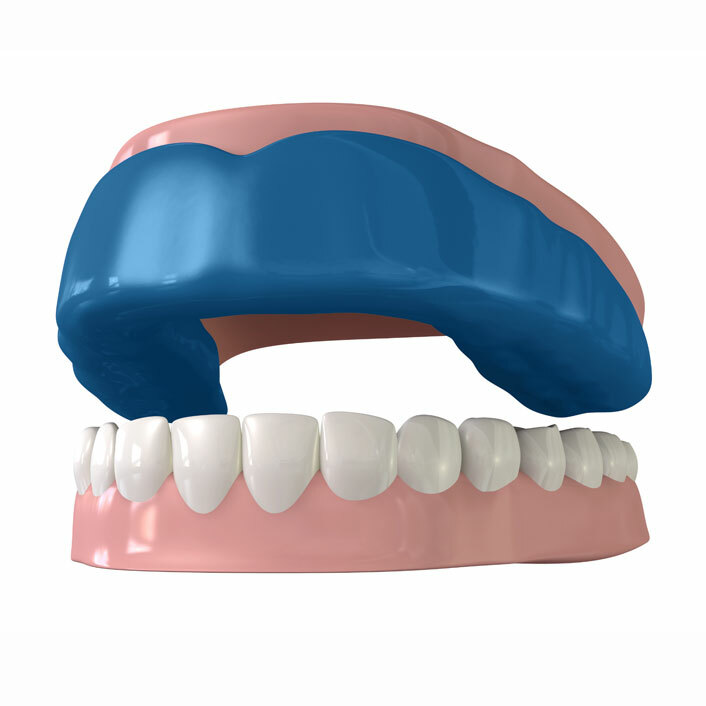 A removable partial denture is a device used when one or more natural teeth still remain in the upper or lower jaw. 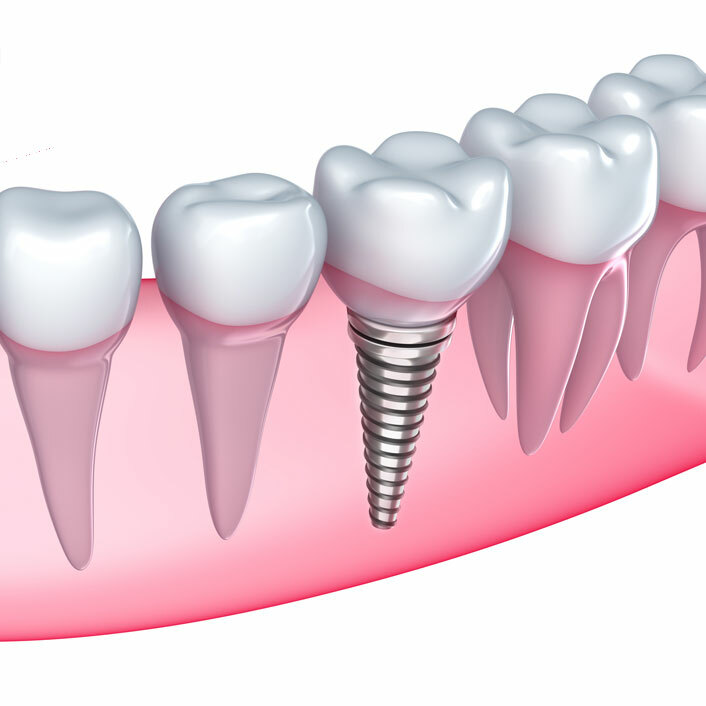 They usually consist of replacement teeth attached to a gum-colored plastic base which is held in place in the mouth by teeth or teeth and implants. A fixed partial denture (bridge) acts the same as a removable denture, but it is cemented into place using the adjacent teeth for support. 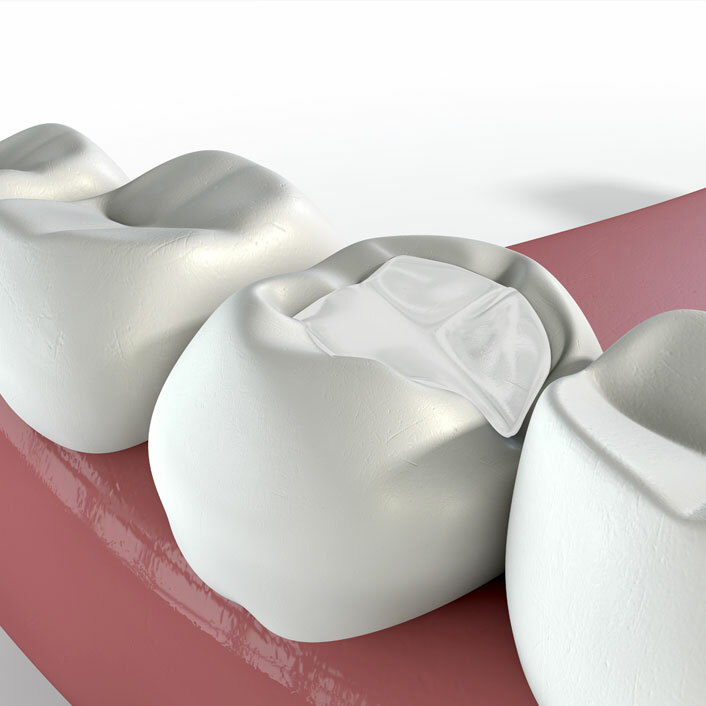 This fills the space created by missing teeth, as well as creates a support for remaining teeth to prevent shifting. Sealants are used to fill in narrow grooves in a tooth that cannot be adequately cleaned by brushing. In some cases, the tooth structure has fine grooves or pits that accumulate plaque—not because the person doesn't brush, but because they're too narrow to allow even one bristle into them. These will develop cavities over time, and no one wants that. I first clean the groove with a water laser to remove all the bacteria. We will brush on a coating that seals the grooves and pits, making it possible to brush off all the plaque and keep your teeth healthy. Sealants make healthy teeth possible. Let us improve your smile today! Veneers are a dental procedure in which a covering is placed over the outside of the tooth. Veneers are usually only placed on teeth that are visible when talking or smile. There are two types of procedures: direct or indirect. 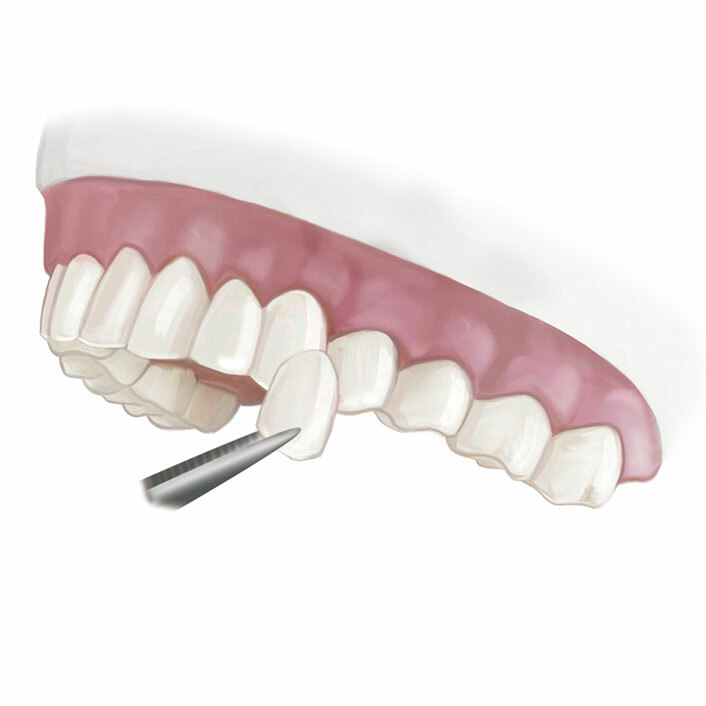 The direct technique usually involves placing composite resin on the outside of the tooth using bonding. This material costs less than porcelain but tends to wear out and often needs to be redone, which could end up costing more. The indirect technique usually involves two appointments because the veneers will be fabricated at a dental laboratory or using our CEREC technique. At the first appointment the teeth are prepared, impressions taken and the teeth are given a temporary covering. In two to three weeks the veneers are back from the laboratory, the temporaries are removed, and the veneers are bonded to the teeth. The laboratory-fabricated veneers are usually made using porcelain or pressed ceramic and are very esthetic. The advantage of veneers versus crowns is that much less tooth material is removed making the procedure generally less uncomfortable. Veneers are recommended for teeth that have large fillings or moderately darkened color change. There is no one solution that is right for all cases. Sometimes a grinding splint is used to prevent clenching or grinding that is contributing to the problem. Dental treatments for this condition can include replacing missing teeth, moving teeth, adjusting the bite, filling gaps between teeth, etc. 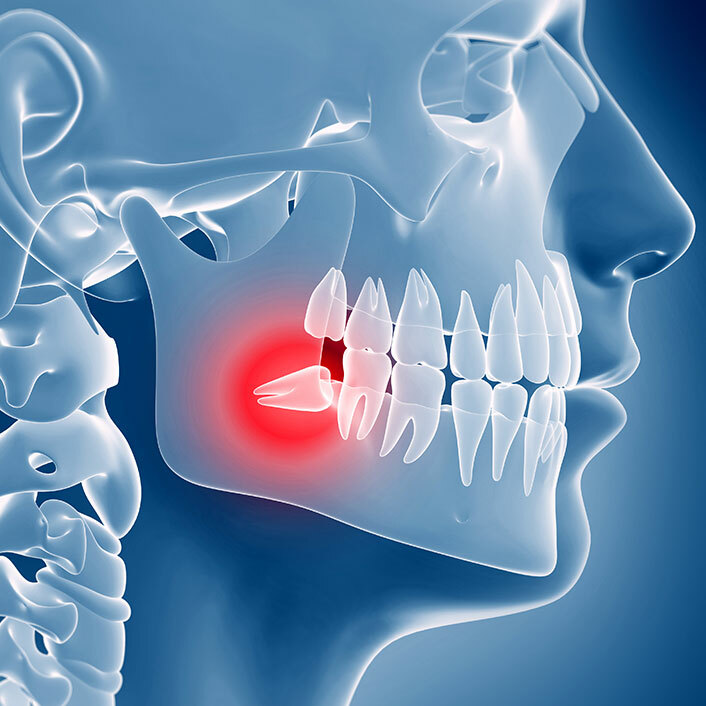 If you have questions regarding TMJ Treatment call our office today! Ask us about how Invisalign can work for you! X-rays are created by using a focused beam of X-ray photons that pass through bone and tissue. Soft tissue in your body does not absorb X-ray photos as well as the calcium atoms that make up your bone. The resulting image is produced on special digital sensor showing the structure through which it passed. This provides the familiar black and white images doctors and dentists use to diagnose problems and disease. Without an X-ray of the whole tooth and supporting bone and gum tissues there would be no way to detect infection or pathology that requires attention. This is an ideal procedure for anyone wanting immediate results. Because the entire procedure takes place in our office in about an hour, it is the perfect choice for busy individuals. In this process, a protective gel is applied to your gums to protect the soft tissue. 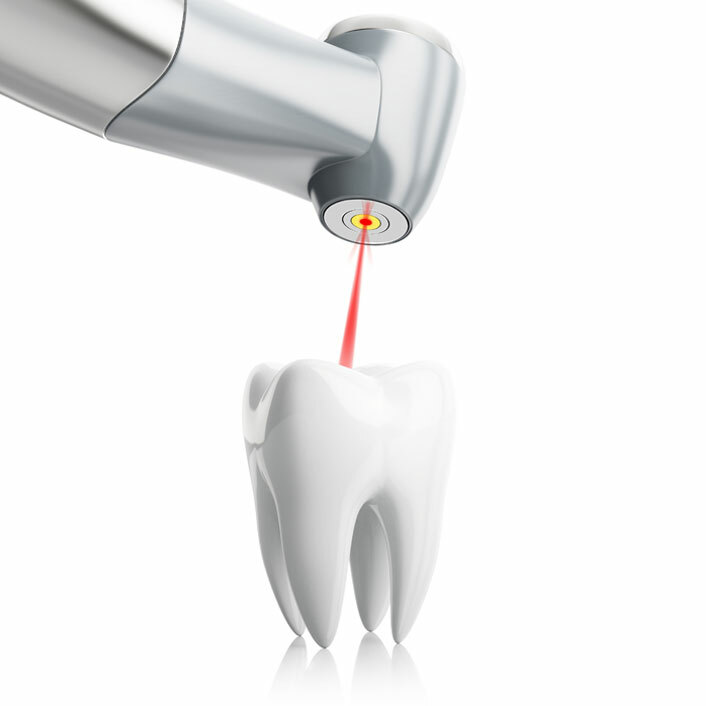 A special laser-activated gel is then applied to your teeth and a laser wand is used to enhance the action of the agent. The result is dramatically whiter teeth that will last for years. This is a less expensive whitening treatment you can use while in the comfort of your own home to gradually whiten teeth. We will first take an impression of your teeth to create a customized clear tray that you will wear to whitening your teeth. Within a few days your trays will be ready to be picked up and we will show you how to apply the special bleaching material to the trays. 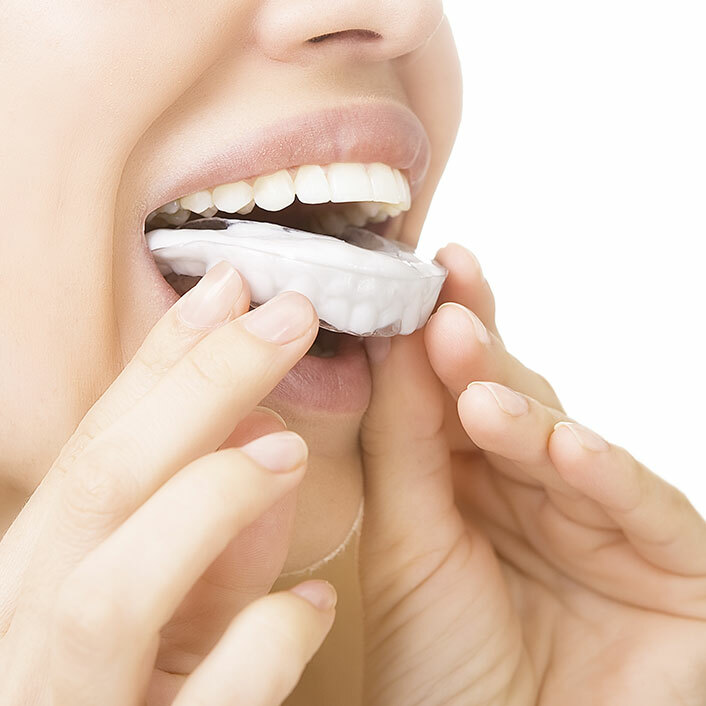 The whitening gel trays should be worn 30-60 minutes up to twice a day. At the end of this period, you will see maximum whitening results that are nothing short of dazzling. 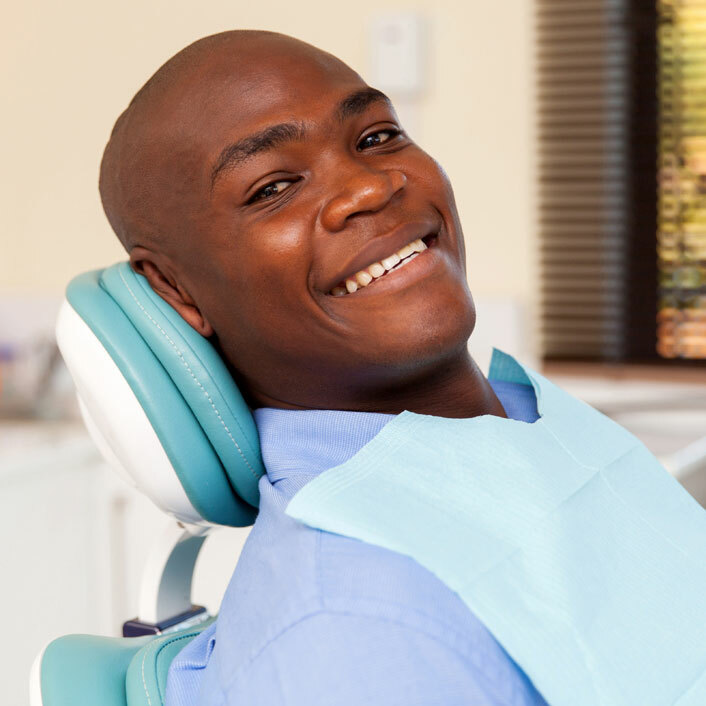 Occasional treatment can be used at your convenience to maintain your new smile. Most cost effective but a little harder to keep in place. Great for the do it yourself person. 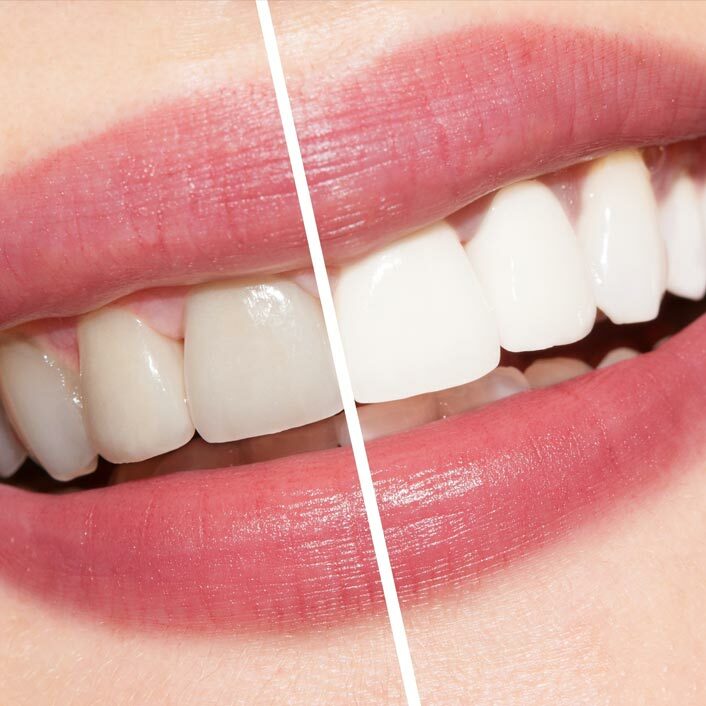 Book an appointment to have your teeth whitened today! 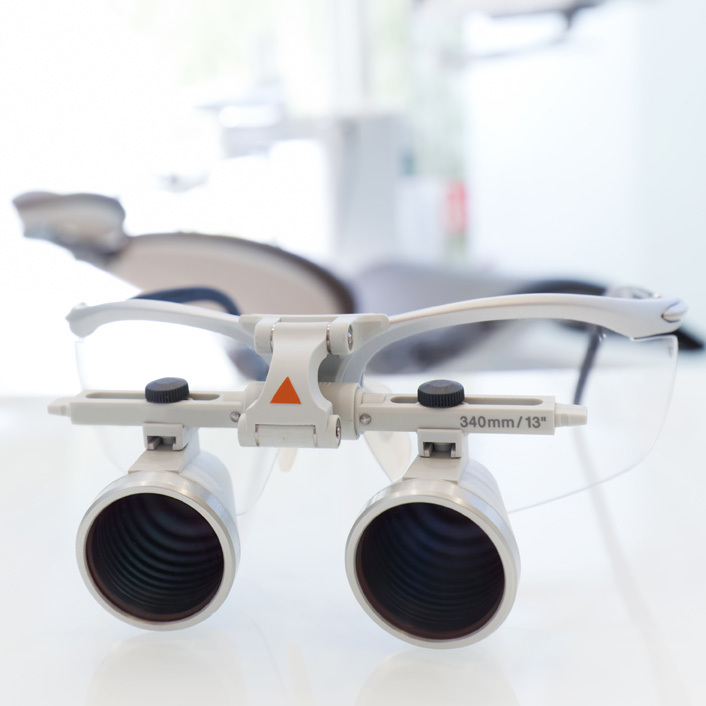 I enjoy using 4.5 power telescopic loupes while diagnosing or working on your teeth. These powerful glasses allow me to see many fine details like decay, cracks or lesions that would go unnoticed by the naked eye. Root canal treatment (also referred to as root canal therapy or endodontic therapy) is made necessary when a cavity is allowed through neglect to reach all the way to the pulp (regular cleanings and checkups prevent and detect problems early). Sometimes deep restorations or trauma to a tooth may cause the nerve to be damaged to the point it needs root canal therapy. Once this occurs the pulp may become infected or simply loose its blood supply and dies. Irritants then can extend through the root tip and begin to erode away the surrounding bone (this is an abscess). By the time the pulp is damaged it must be treated, and cannot heal on its own. It can even weaken the entire immune system. This is dangerous not to mention very painful. Symptoms that the pulp has become damaged or infected may include sensitivity to hot/cold or sweets, pain, swelling, pain to biting or pressure, and a bad taste in the mouth. Sometimes, however, no symptoms are apparent and the person is unaware of any problem until a checkup and x-ray may find a cyst. A root canal is then performed to clean out the damaged tooth pulp and cleanse the canals of the tooth. The only other option would be to extract the tooth. Once the inflammation/infection is resolved, the canal(s) are filled in to prevent further infection. 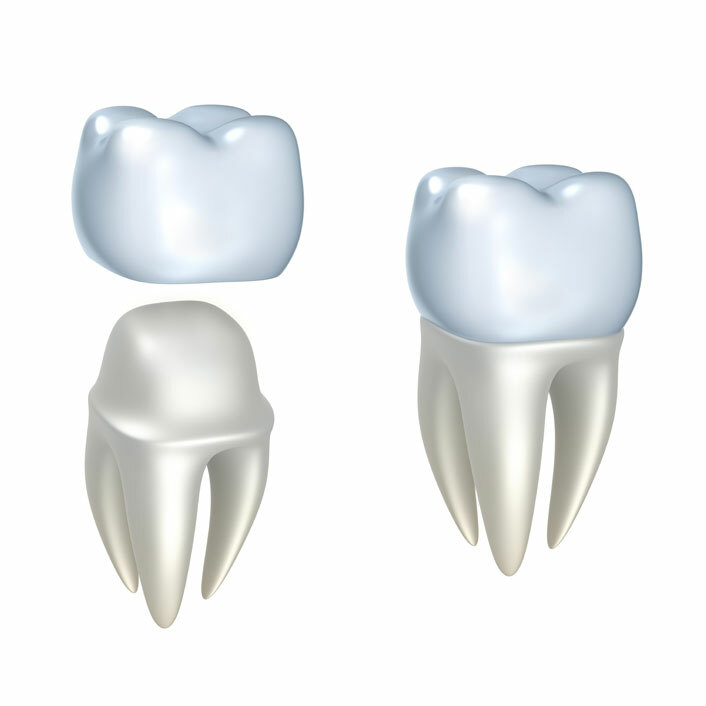 Usually a crown is recommended for restoring a tooth that has had root canal therapy to restore the tooth’s strength. 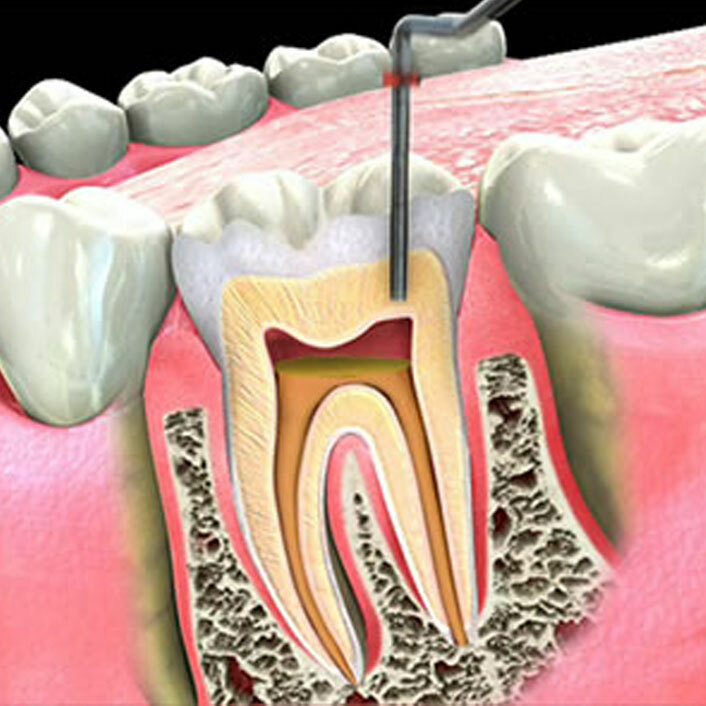 An apicectomy (also known as surgical endodontics, apical surgery or peri-radicular surgery) should be considered only when conventional endodontic root filling (‘root canal treatment’) techniques have failed. A conventional endodontic treatment is indicated if the dental pulp (‘nerve’) of a tooth becomes non-vital (dies) or is likely to be put at risk due to the type or size of restoration needed to repair the tooth. During endodontic treatment, the dentist removes the dead remnants of the dental pulp and replaces it with an inert filling material which is visible on an X-ray. 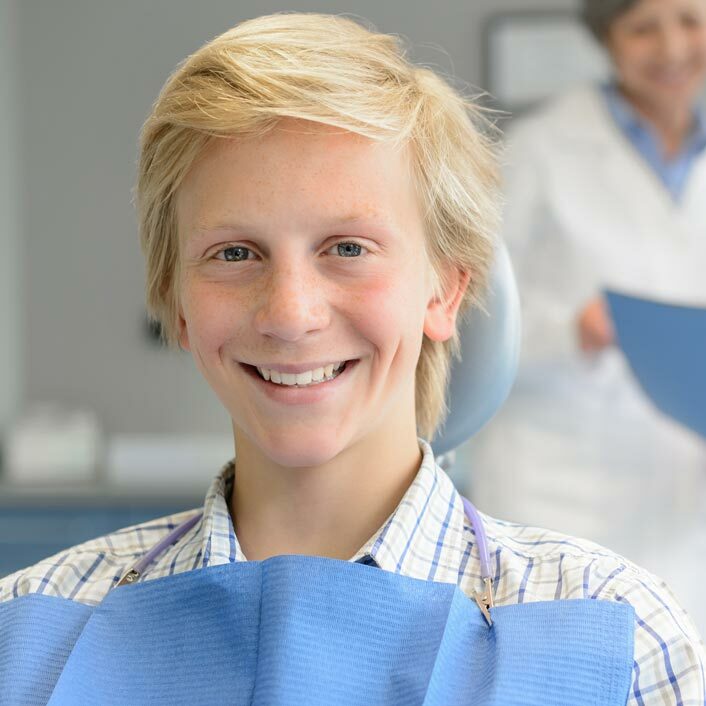 Most teeth will respond satisfactorily to this type of treatment and become symptom-free. Our office’s computer system has digital charting. This means all X-rays and charting are made and recorded with the aid of the computer. This technology allows us to maintain your dental records electronically and cut down the unnecessary paperwork used with traditional paper charting. Traditional paper charting is difficult to keep standardized from doctor to hygienist to assistant—even handwriting differences and coding make the charts look different. 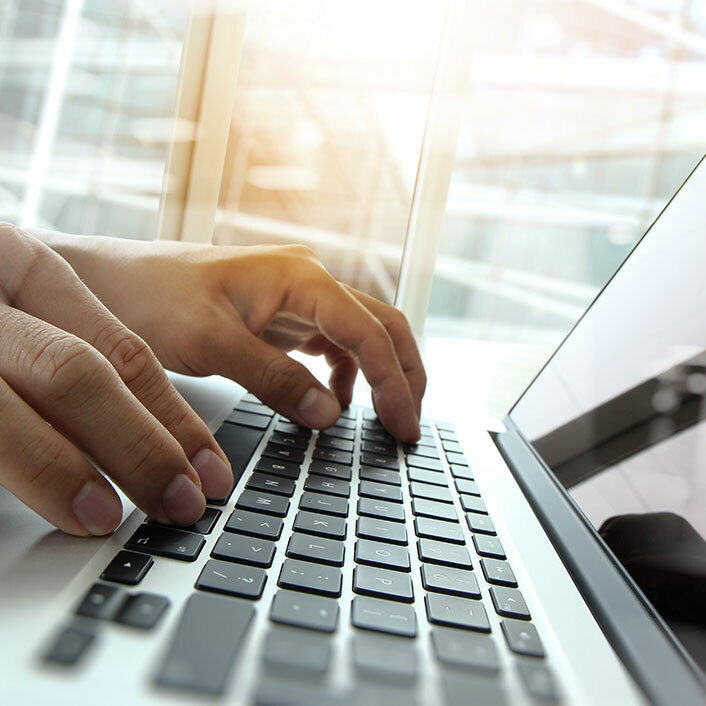 The computer eliminates this problem by using consistent charting methods that are accurate and precise, making it easy to read your dental chart and see up-to-date information. Digital charting standardizes the charting process so it is clear, easy to understand, and enables us to provide on the most accurate and precise care to our patients. Digital charting allows us to quickly and securely share information with your other health care providers when needed. We still like to use personal phone calls as our main communications and appointment reminders. We do have the ability to email or text you reminders if you prefer. Let us know method you prefer. Let us know which method you prefer. The first goal after an extraction is to form a blood clot at the site. Usually a moist gauze is placed for 5-15 minutes. We will make sure your initial clot is in place before you leave. Keeping the clot in place allows healing and covers the sensitive bone. Avoid hard foods, heavy lifting for a couple days and the use of straws to avoid suction that dislodges the clot. After two days, begin gently brushing the area as tolerated. Pain medication will be individually prescribed for you. In the case of a previous infection or compromised health an antibiotic may be prescribed. The socket area will heal from the bottom and sides of the socket and is best left alone for optimal healing. 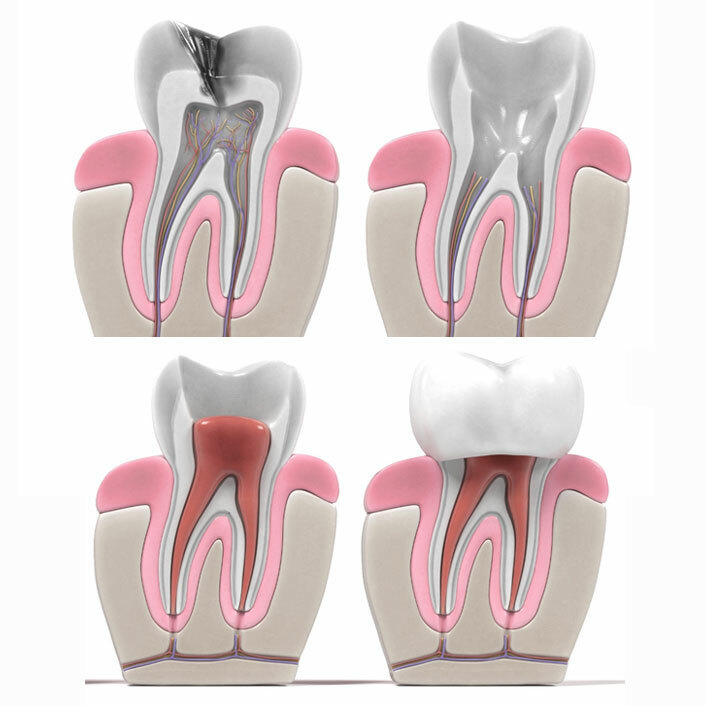 Predicting pain after a root canal most often depends on the state of the tooth at treatment. If you arrive at our office in pain expect two to three days after opening (starting) or completing a root canal. Pain medications most often take care of the pain to tolerable levels. Signs of infection are, more than slight swelling or that gets larger over time, fever and tiredness. Report these symptoms early so we can place you on antibiotics. A root canal completion about 50% of the time there is minimal discomfort after treatment. About 45% of the time moderate discomfort occurs because some of the canal debris gees out the root end and must be cleaned up by your body. Usually a moderate pain medication like Advil can get your through. Less than 5% of patients have infection or extreme pain. When this happens coordinate your care personally with myself or staff. Clean your teeth well with an electric brush five minutes a day to remove plaque. Plaque causes gum disease and decay as well as bulging gums around brackets. Eat carefully to avoid breaking brackets. Avoid sugar and starch filled foods and you will be happy with little or no decay in you teeth at the end of treatment. 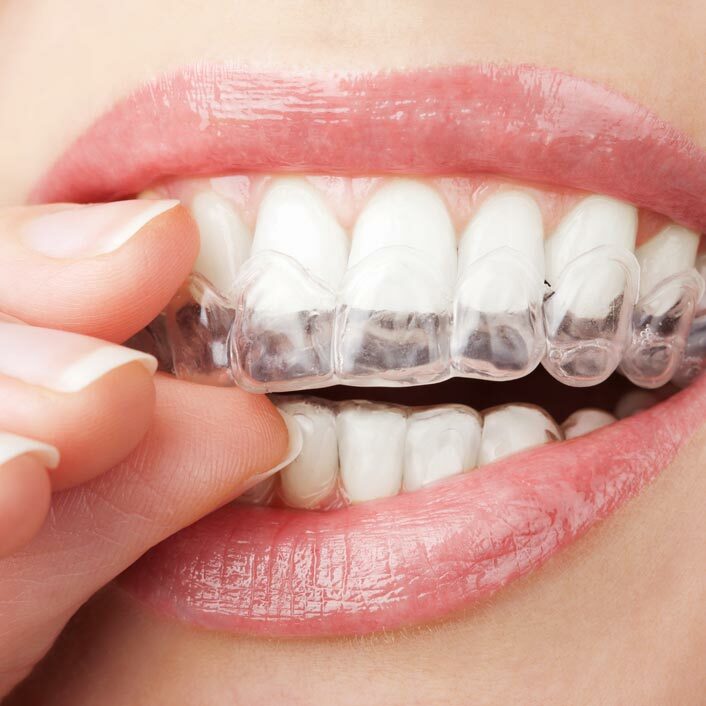 Keep them straight with retainers. The simple rule is muscles always win when pushing against teeth. Other sleep habits like clenching, grinding, mouth breathing, tongue thrusts and sleep positions all can move teeth. The solution is great night time retainer wear possibly for a lifetime. All dental restorative stresses the tooth to some degree. We try to minimize this stress by using lasers, careful decay removal, magnification and experience. Generally if the pulpal tissue inside the chamber of the tooth is healthy then the tooth is comfortable after restoration. An irritated pulp tissue that will probably get better over a few weeks time has sensitivity to ice for three seconds or less once the cold is removed. If this gradually improves your tooth healed itself because of its good blood supply. Teeth that have had more stress placed on the pulp (from cracks, deep decay, fractures etc) causes the pulp to lay down for dentin inside the root. This narrows the canal pinching off the tooth’s blood supply causing the tissue to die. These teeth often need root canal treatment or removal for your comfort. Sometimes cavities can happen. A filling can help restore a tooth damaged by decay back to more normal function and shape. 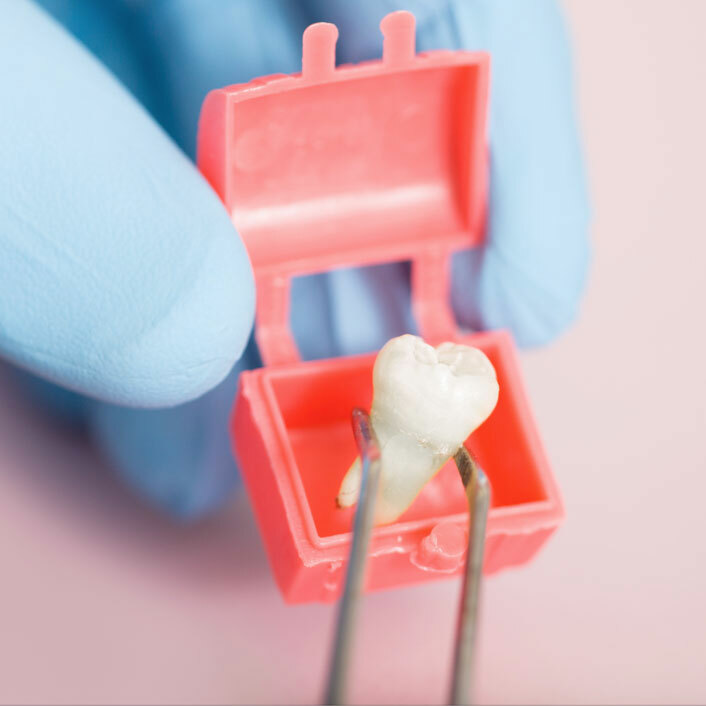 If you have a tooth that requires a filling, we will first remove the decayed tooth material, clean the affected area and then fill the cleaned out cavity with a filling material. This composite material seals the tooth so bacteria cannot enter and cause more decay. 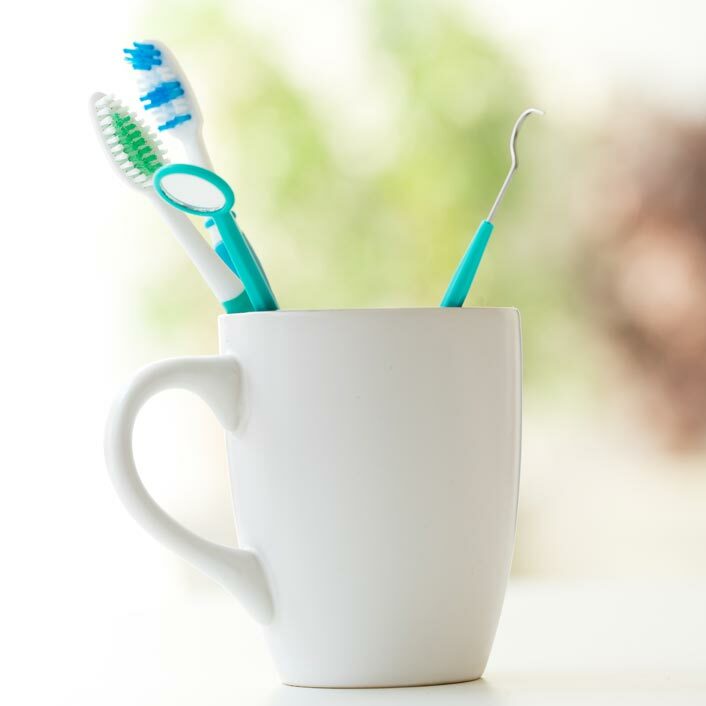 It is important to consistently floss and brush your teeth to extend the lifespan of your filling. 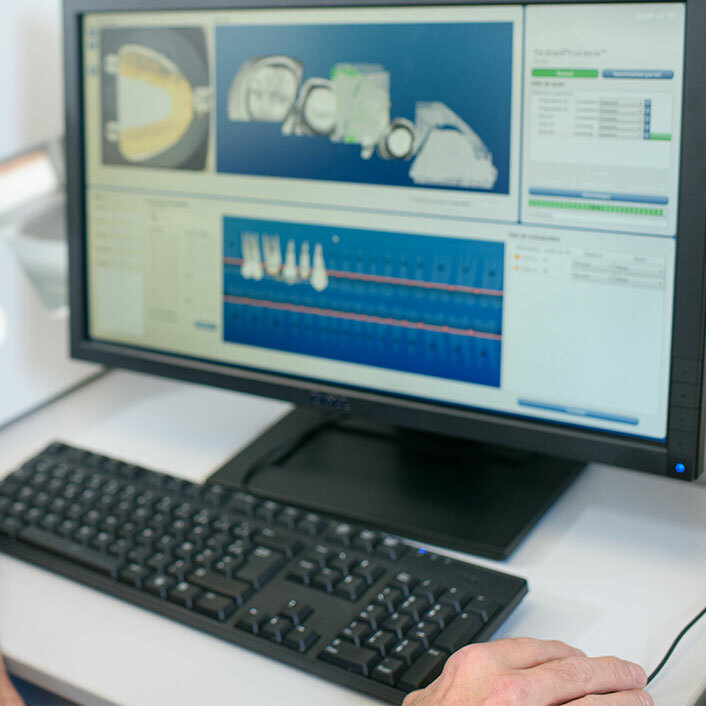 CEREC fillings are called inlays or onlays and are custom made in our office using CEREC technology, then bonded to the tooth. They can be matched to the color of the tooth, resist staining, and have a cost midway between fillings and crowns. . A porcelain restoration generally covers most of the tooth, making the filling nearly undetectable. Amalgam fillings are most often used in areas not seen and along roots that composite fillings do not bond. If decay or a fracture has damaged a large portion of the tooth, a crown, or cap, may be recommended. Decay that has reached the nerve may be treated through Root Canal therapy or through a procedure called pulp capping. If you have a question about which treatment is best for you, give our office a call! 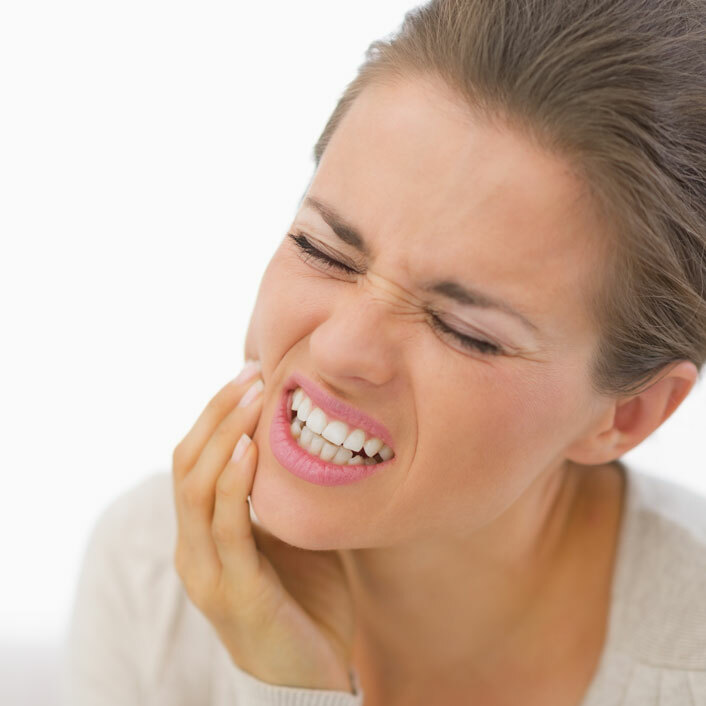 Sever pain or discomfort in the jaw, gums or teeth can often become unbearable. We offer same-day emergency dental services and appointments to provide immediate relief and long term dental solutions! 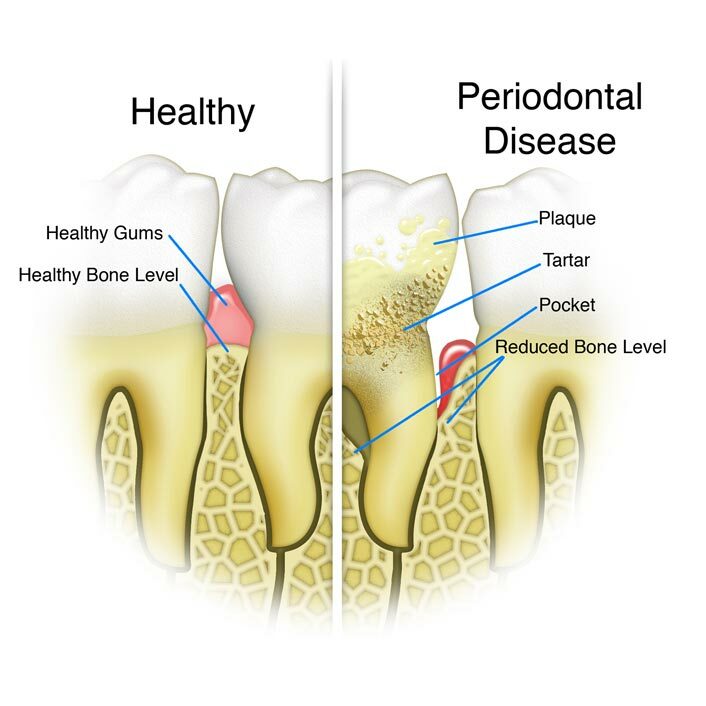 Periodontal treatment typically involves containing the infection through deep cleaning like scaling and root planing, clearing buildup at the root of the teeth. The dentist may also suggest specific toothpastes and mouth rinses. We may also prescribe antibiotics to fight infections. Surgery is required for the most severe cases.